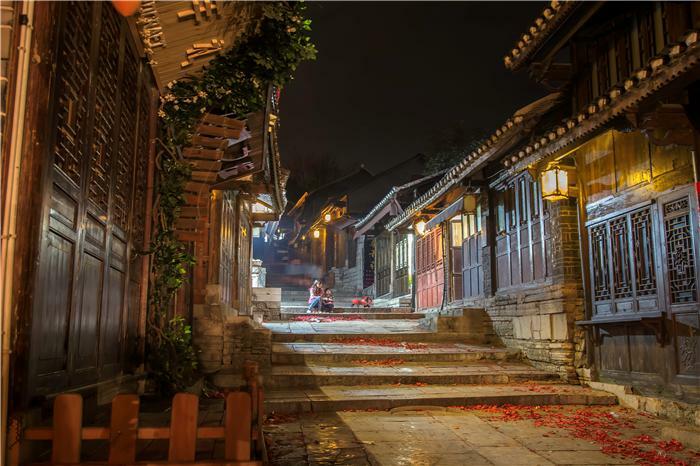 It was first built in 1378 (the 11th year of Hongwu of the Ming Dynasty), and nowadays Qingyan Ancient Town is a famous cultural town in Chinese history. 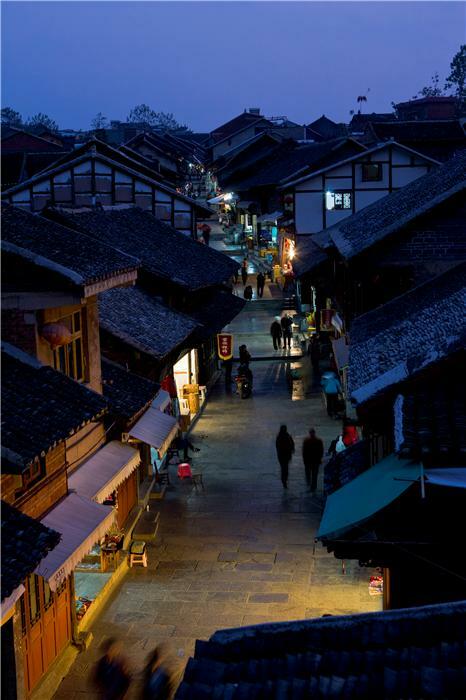 Historically, Qingyan Ancient Town was a traffic lane and also a strategically vital position. Originally Qingyan Ancient Town was just a soil city wall. The city wall gradually turned into a stone town with streets and alleys interlacing after being repaired and expanded for several times. The gate tower reaches to the sky, and the city wall wriggles. 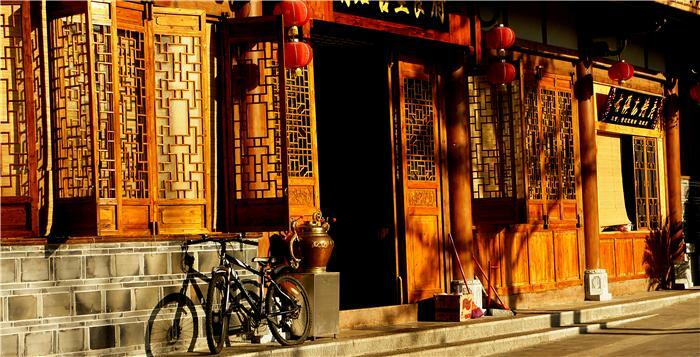 In the town, there are streets and alleys interlacing and peaceful flagstone walkway, and the old buildings elaborately designed during the Ming and Qing Dynasty intersect with each other. In Qingyan Ancient Town, the people are simple and honest, and there are rich special local products. The local products, such as Qingyan Tofu, Rose Sugar, Pot-stewed Pig’s Trotters, Shuanghua Vinegar and Rice Jelly, are well-known far and near and loved by all visitors. Qingyan Ancient Town has profound culture, where Buddhism, Taoism, Catholicism, Christianity coexist. During the Anti-Japanese War, Zhou Enlai’s father, Deng Yingchao’s mother, and Li Kenong’s family once lived there, leaving some relic sites, such as the Red Army’s Command Post, the former site of Zhejiang University, the former teaching site of Su Buqing. In Qingyan Ancient Town, there are old building complexes with ancient melodies: nine monasteries, eight temples, five pavilions, two ancestral halls, one courtyard, one tower, some stone arches and a city wall, therefore, Qingyan is honored as one of the most charming ancient towns in China. The history of the ancient city of four and eight at church, is now preserved only outside the South Gate of "Zhou Wang Fang, Liu Shijie daughter-in-law filial piety" South Gate "Zhao Lilun baishoufang" and the north gate of the "Zhao Caizhang baishoufang" three. Three church building model is basically the same, four were three, four on the third floor, roof, 9.5 meters high, 9 meters wide, face north south, is the Qing Dynasty stone arch architecture. Surprisingly, the three arches are not foundation on 4 rectangular column directly stand on the ground, and a vertical 100 years. The "Zhao Lilun baishoufang" from sadahiro door only a few steps, creative and unique, is praised as "the art master Liu Haisu is a rare and rare works of art", three stone arches have become the love of photography fancier. In fact, Secluded Street is an old lane built by stones. It connects Temple of Wealth God in the east, reaches Ciyun Temple in the west, and links up South Street and West Street inside of Qingyan town. The lane winds with ups and downs, not only with a country style but also with features of urban streets. It is a model of streets and alleys in Guizhou ancient towns. When the street was built, all the boulders, block stones, agglomerate stones and irregular stones were bonded and laid by glutinous rice starch, tung oil and lime. Different stone materials and building methods were used to make the detailed textures of stone lane abundant, free and regular, along with a feeling of long tranquility. During the Anti-Japanese War, Li Kenong’s family and Meng Qingshu’s family lived in a courtyard of this street, and the film “The Missing Gun” found views in Secluded Street, too. Former residence of No. 1 Scholar Zhao Yijiong was built in the early Qing Dynasty which has nearly 300 years’ ago. The binary quadrangle was made of brick and wood with tenoning through beam and overhanging gable roof, covering an area of 650 m². A main entrance, private rooms, corridors, main rooms and other buildings composed to be a perfect building with typical southern architectural style, which became one of the representatives among a hundred cultural architectural relics. On the right side of this yard are wooden engraved doors and windows which are elaborate works in the field of woodcarving. Former residence of No. 1 Scholar Zhao Yijiong has a reading room, a living room, a main room, a double-parvis, and a longevity drawing. Except exhibitions of relics from his life, the Chinese imperial examination system, and cultural relic pictures, there is also the painting and calligraphy of famous writers in Qingyan to encourage all people to love their home town, and to establish a new atmosphere in advocating culture. Wenchang Pavilion was built during Wanli Period of the Ming Dynasty (1573-1619), with brick and wood overhanging roof. It is a binary quadrangle lying south and facing north, with a total area of over 800 m². The whole building group is made up of rooms for ritual purification, cross-hall, front hall, wing-rooms and attics. In the front hall, the ancient educational Chinese representative, Confucius and his 72 wise disciples are enshrined here and in the Shuixing pavilion of the second quadrangle, the Emperor Wenchang who is said to be in charge of all intellectuals’ fates, is enshrined here. Nearby, a lotus pool is reserved well and the stone carvings in front of the attic, the stone fences and drum stone are all repaired as they were. The wooden and stone carvings in the attic are carved with fortune designs, such as “Two Dragons Holding Treasure”, “Two Phoenixes Flying to the Sun”. The 2 huge stone vats, whose frontage is carved with characters, flowers and grass, are also reserved well. 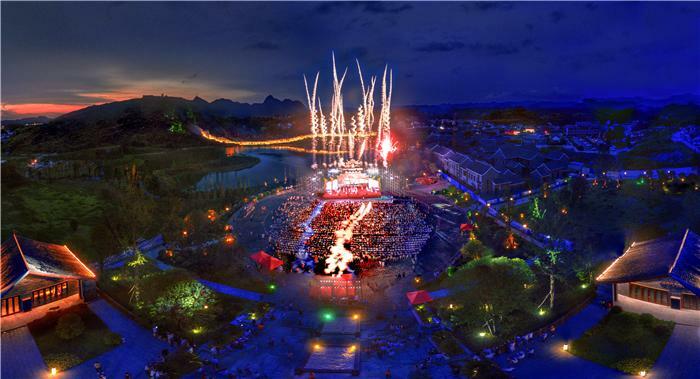 Guiyang House Records praised it as “a wonderful place with flowers and bamboos in Qingyan”. Ciyun Temple was first built in the years of Kangxi in the Qing Dynasty, and rebuilt in 1832 (the 12th year of Daoguang). The temple is made of brick and wood with tenoning through beam and overhanging gable roof, facing to the east, with a total area of 1200 m². Its entire architectural framework has been kept in good condition to this day, and many of the carved cornerstones are considered to be among the highest quality of artistry in Guiyang city. The wood carvings of the theatrical stage lay on the upper and lower architraves. These exquisite wood carvings show some stories among the historical characters like Liu Bei, Zhang Fei and Guan Yu. The stories include “Zhou Yu’s Schemes”, “Three Heroes VS Lv Bu”, “Liu Bei and Cao Cao Commenting on Heroes while Heating Wine”, “Zhang Fei’s Defense at Dangyang Bridge” “Cao Cao Guiding Troops toward Eastern Yangtze River” and “Guan Yu Drowning Enemies”. In the middle of theatrical stage is the large bas-relief Chinese character “Fu” with dragon and phoenix shapes, which is the art treasure of highest quality. Wanshou Palace, also called “Tianzhu Palace” or “Jiangxi Guide-hall”, is a Taoist temple. It was built in 1778 (the 43rd year of Qianlong in the Qing Dynasty), and rebuilt both in 1796 (the 3rd year of Jiaqing) and in 1832 (the 12th year of Daoguang), with a total area of 1100 m². The Palace lies east and looks west, whose main hall, side hall, wing-rooms, theatrical stage and living quarters compose a large building group. Under the cornice of theatrical stage stands a unique wooden pier curved with picture of “Two Lions Contending for the Supremacy” (known as Chuihua pillar), which is quite rare and precious in Guizhou’s ancient architecture: “Banquet of Hongmen”, “Hanxin Reviewing Troops”, “An Ambush on All Sides”, and “Being amidst Enemies” are really amazing works. During the period of the Anti-Japanese War, National Zhejiang University removed in Qingyan and established school here, leaving people unforgettable memory. The facts between Qingyan Ancient town and Zhejiang University have been recorded in history and shall be passed on. Yingxiang Temple was first built in 1621 (the 1st year of Tianqi in the Ming Dynasty) by Master Zhi’an, and was rebuilt in 1825 (the 5th year of Daoguang in the Qing Dynasty). 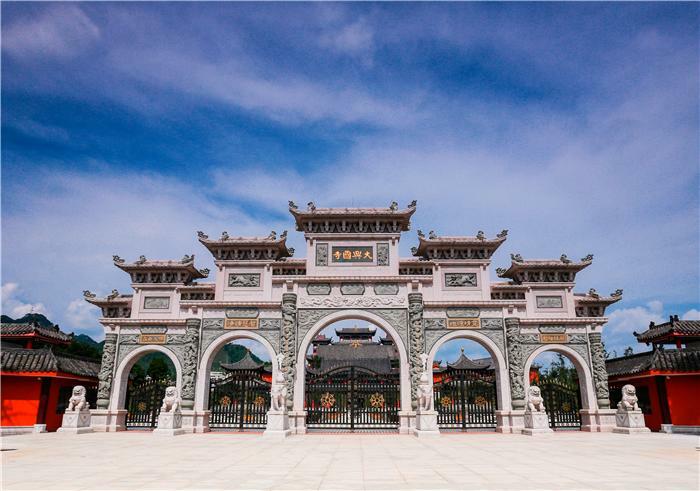 Wing-rooms and Weituo Hall, memorial archways and bouncing wall were added, and till the 30th year of Daoguang, the repairing work was finished. Later, some local despotic gentry raised funds to build a pavilion in front of Yingxiang Temple for consecrating Doumu God of Taoism. Villagers here hadn’t realized the pavilion’s appearance for a long time, and then Yingxiang Temple was commonly known as “Doumu pavilion”. 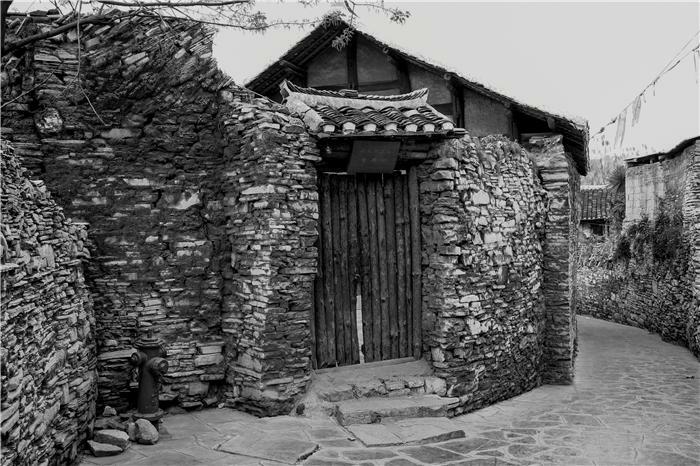 According to relevant records, monk Cisong, the earliest founder of Hongfu Temple in Qianling Mountain of Guiyang, settled at Yingxiang Temple. In the 39th year of Kangxi, Zhou Yuhuang working in Beijing asked for a leave to visit his family, and then Cisong invited Zhou Yuhuang to preface for his “Records of Qianling Mountain”. So Yingxiang Temple is also called “Ancestor Temple of Qianling Mountain”, which is now a municipal site of cultural relic protection. During the Anti Japanese War, these walls intact, four gates are still safe, remote, accepted a lot of "asylum seekers". The Eight Route Army Guiyang traffic station set up security in Xuan Qingyan, many of the revolutionary cadres and their families evacuated to here, Zhou Enlai's father, Deng Yingchao's mother, Li Kenong and Bogu (Qin Bangxian) families have lived in qingyan. Li Kenong was living relatives: located in the town of Qingyan No. 10 North Street, from 1939 to 1941, Li Kenong and other Chinese leaders of the family has been living in this, is still dwelling; the mother of Deng Yingchao had abode: located in the South Street No. 75, Deng Yingchao, the mother of MS. Yang Zhende from 1939 to 1941 has been living in this house, is still operating, fast food; Zhou Enlai the father was living in prime minister Qingyan Back Street No. 2, from 1939 to 1941, Zhou Enlai's father Zhou Maochen the old man lived here, has been open to the public. 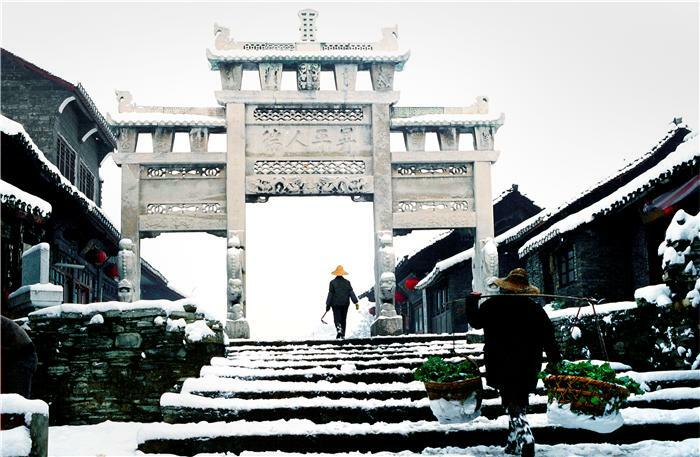 Dingguang Gateway, the symbol of Qingyan military ancient town, was built in the Apocalypse of the Ming Dynasty. In 1660 (the 17th year of Shunzhi in the Qing Dynasty), Ban Yingshou, the son of Ban Lingui, taking over his father’s post (the chieftain), built Dingguang Gateway. In 1798 (the 3rd year of Jiaqing in the Qing Dynasty), military Ju-ren, Yuan Dapeng rebuilt it. The gate tower is made of wood, having three rooms with gable and hip roof with multiple eaves. The roof is made of cinereous tiling, clay cresting, and the wall is equipped with crenels and batteries. Viewed from a distance, the wall is so magnificent and grand. 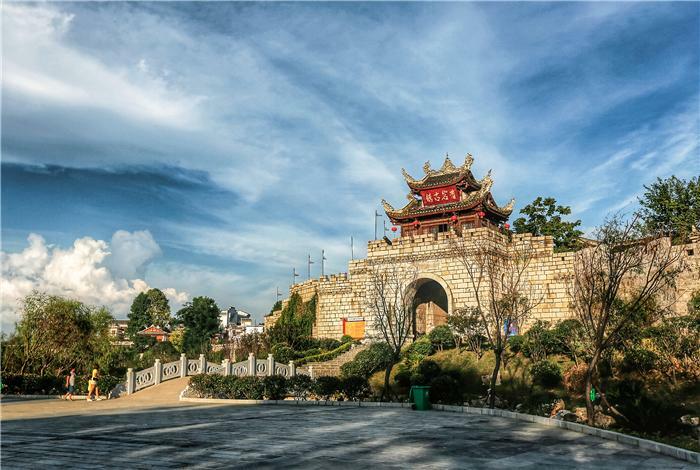 It, known as “South Gateway of Guiyang”, was important military defense of southern Guiyang in ancient times. The construction of the city to meet the military needs of Qingyan, the ancient dynasty unmanning land, known as the "tea horse road" and "South Fort"
In the selection of Qingyan pig is extremely convenient, the pig is about one year old local rural feeding pigs take ten taste pig's trotters, rare Chinese traditional medicine, Wei and scriptures fire temperature, food, accompanied by local specialty Shuanghua vinegar, a authentic pig can send Qingyan in the entrance, entrance to feel fragrant glutinous rice is abnormal, fat but not greasy. Qingyan stewed pig long-standing, over a hundred years of history, it is also called the champion shoes. Qingyan tofu is a traditional snack in Guiyang City, is the tofu, grilled, baked tofu to two yellow, in the fire and then poured some seasonings, eat special refreshing, different from Sichuan's spicy taste, a little less, but also do not have a flavor. Frozen ice red wine, taste sweet. Authentic, so you have a year round to eat red. High nutritional value of red, is a natural green health food. According to the determination of quality: waxberry flesh's sugar content is 12% ~ 13%, acid content was 0.5% ~ 1.1%, rich in cellulose, mineral elements, vitamins and a certain amount of protein, fat, pectin and 8 kinds of beneficial amino acids, the fruit of calcium, phosphorus and iron contents higher than other fruit 10 times. Effect of thirst, spleen appetizer, eat not only hurt the stomach, and cold dispelling the effect of detoxification. "Compendium of Materia Medica" records, "Yang Mei can quench thirst, and the five internal organs, can wash stomach, Chufan smells confused." Have "fruit in the agate" of the reputation of "green pollution-free fruit". Huaxi beef powder originated in Guiyang Huaxi area, is a feature of Guizhou snacks, its unique soup, is made of precious Chinese herbal medicine careful production, make the beef powder out of the ordinary, delicious soup, meat. People eat praise. Huaxi beef powder flavor, loved by the people, in addition to taste, drink a bowl of delicious tempting aroma, rich beef soup is also a kind of enjoy delicious. The salt dish ingredients for vegetables with leaves, or bulk food (like radish, radish root broken leaves, and leaves the emperor and similar). The leaf and root, remove the fascia, thick skin, washed and hung three to five days on the line (the sun is the best, as the leaves become pickled and soft, and containing moisture) later, the big tub, salt and knead until juice and add pepper, aniseed, cinnamon and so on the spice mix (or not added spice), sack stone (stone and other heavy objects) pressed, pickled first seven days, take it out and the sun a day into the cage steamed is dry, so the sun steamed knead two times, the number of up to 1 dish, a lodging in the tank (a mouth down, upside down, special jar jar mouth) to use curcas leaves or banana leaves cover the lid, and then dry straw or dried leaves (leaves to clean) tightly, inverted on the basin of the fermentation, after half a month, you can remove the use of.